Sometimes during my questionably numerous hours on the internet, I come across “healthified” recipes that look pretty good, but still make me wonder why you wouldn’t just make the original. I’ll admit, I made it mostly out of curiosity. Unlike many modern Americans, I am not afraid of potatoes. In fact, potatoes themselves are quite healthy for you, and can be an excellent source of nutrients. Sure, they are pretty high carb, but I’ve never paid much attention to carbs so it doesn’t concern me. Potatoes get a bad rap but it’s not the vegetable that is the problem, it’s how we prepare it: French fries are clearly unhealthy, but then of course we like to pile on loads of salt, cheese, chili, et cetera, just to really make sure we’re not benefiting at all. 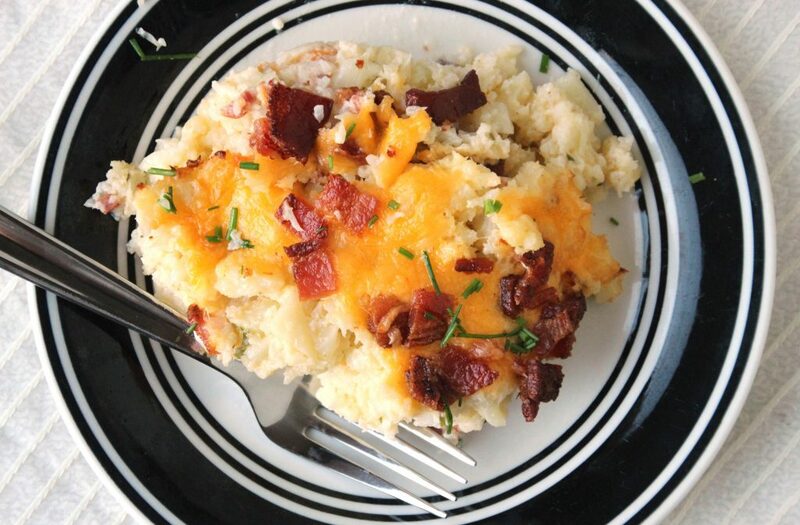 Mashed potatoes are typically made with loads of butter and cream and various other dairy products that add tons of fat and unnecessary calories, along with their delicious, wonderful flavors. Baked potatoes, we say, those are healthy! And yes they are…until we add the toppings. This particular recipe kinda makes me giggle because the things that make potatoes unhealthy are still quite present in here, whereas the potatoes themselves have been substituted with cauliflower. I vastly cut down the additions from the original, and even made it a second time to cut them down some more, but I’m still not sure I’d consider it a truly healthy side dish. In any case, it is quite delicious, and if you’re into the low-carb situation, maybe it’ll be great for you. It probably won’t become a staple around here, but it’s a great way to spice up an otherwise familiar palate. Or sneak some cauliflower into picky eaters. 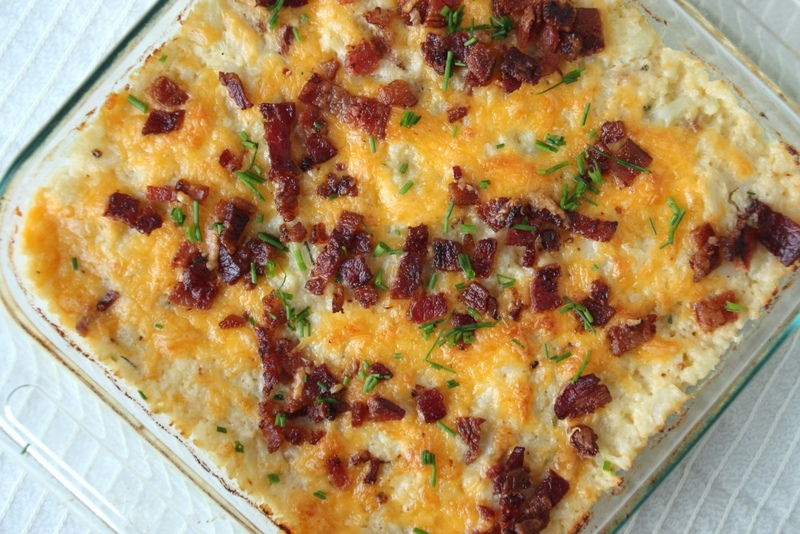 Creamy and cheesy and optionally topped with bacon, it has a texture like slightly lighter mashed potatoes and all the fun flavors that go with them. 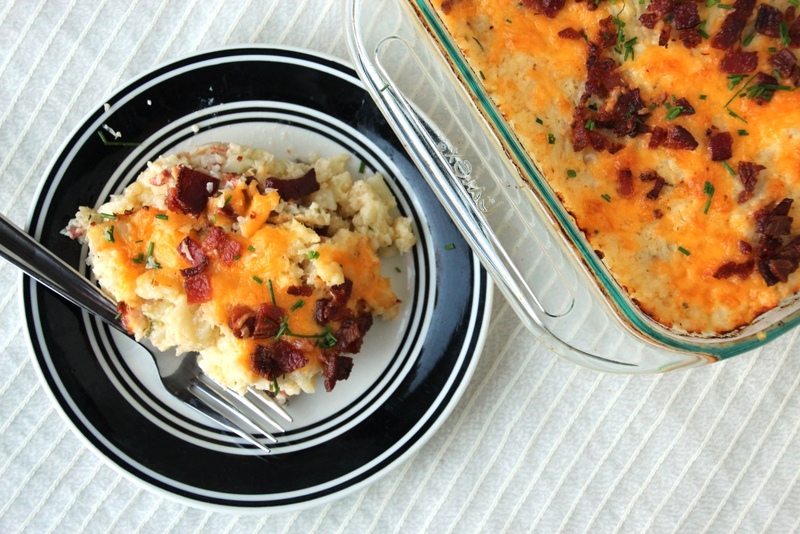 It makes for a great side dish and could easily be made vegetarian simply by nixing the bacon. The second time I made it without bacon and it was excellent as well. Although I likely won’t be making it weekly, or even monthly, I did really enjoy the final product and it was a fun way to eat cauliflower. It also reheated nicely which is always a pleasant surprise. Hope you enjoy it! In a large pot, boil cauliflower until softened, about ten minutes. Preheat oven to 425 degrees Fahrenheit. Spray an 8×8″ baking dish with cooking spray, set aside. Drain completely and return to pot. Mash or puree into desired texture. I used an immersion blender to puree mine completely in order to mimic mashed potatoes. Return pot to stove over medium heat, and cook at least 5 minutes longer (stirring constantly) to evaporate excess water1 . Remove from heat. Add sour cream and 1 cup of cheese, and stir until completely combined. Salt and pepper to taste, making sure it’s well mixed. Bake for about 20 minutes, until cheese is melted and cauliflower is bubbling. It might look kind of watery, but don’t worry, that’s normal. Let cool on the counter for about 5 minutes before serving, then top with chives (optional) and enjoy. 1 In my opinion this step is paramount. 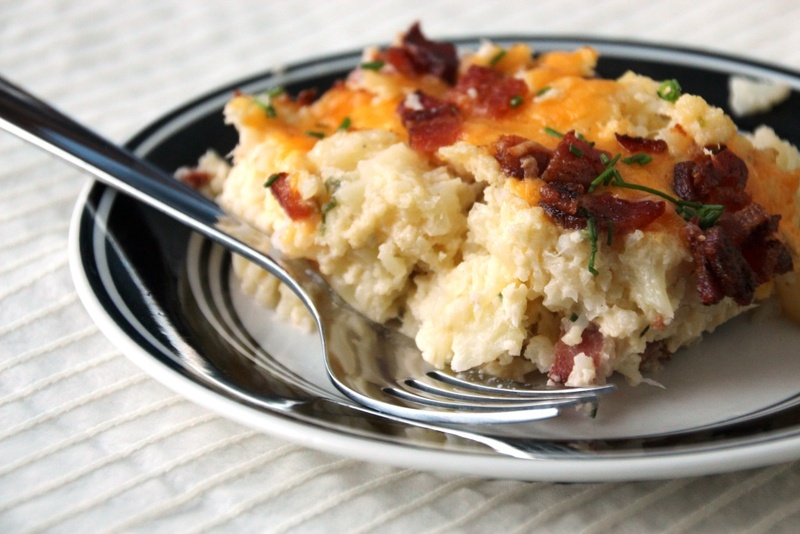 Nothing is worse than watery mashed potatoes and this casserole is no different. I recommend tasting a couple of times, and keep going until the cauliflower doesn’t just taste of water, especially if you pureed it. I’m sure you could but you’d definitely taste the difference. Personally I don’t think I’d like the flavor but texturally I think it’d work the same. If you try it let me know what you think, but to be honest I don’t really think yogurt is that much healthier.